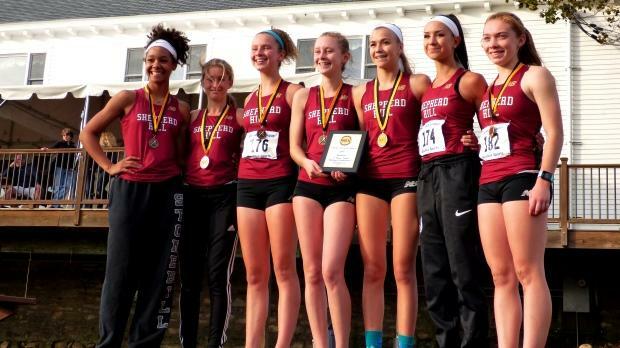 Shepherd Hill captured the Division A girls' title at Saturday's meet. Varsity members (L-R), Emma Sullivan, Gabrielle Lawrence, Helena Duke, Kasey Clark, Rebekah James, Audrey Carragher, and Emma Whitehead. 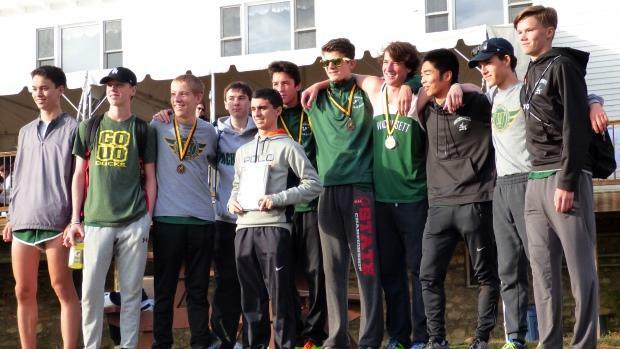 It was a busy day at Saturday's Mid-Wach Championships with 10 (boys and girls) divisional races taking place on the grounds of Hollis Hill Farm in Fitchburg. Among the girls, Rebekah James of Shepherd Hill posted the fastest time in the five different races. James won the Division A race with a time of 18 minutes, 50 seconds. Algonoquin Regional's Tess Reyes was second in 19:03. With five runners in the top eight, Shepherd Hill won the team title, defeating second-place Wachusett, 25-44. Quabbin Regional's Benjamin Morin clocked the fastest time among boys, winning the Division C race with a time of 16:46. Tyngsborough's Corey O'Neill was second in 17:13. Quabbin beat Tyngsborough for team honors, 38-62. We have PHOTOS and COMPLETE RESULTS from Saturday's meet!